Her hairdresser hit the headline when she gave the interesting insight into just how much work goes into keeping glossy mane intact of the pregnant duchess. Amanda Cook Turner gives royal fans a preview of hair products that are needed to style the hair of Duchess of Cambridge. In the photo, the hairdresser had 13 brushes, six combs, two hairdryers and cans of hairspray. She also wrote an eye-roll emoji next to the picture and she eventually deleted her Instagram account. 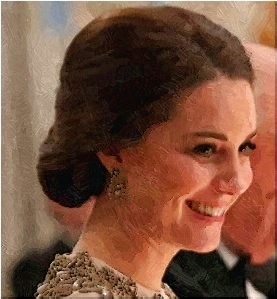 Mrs. Tucker became Duchess Kate’s hairdresser since the royal couple’s Diamond Jubilee Visit in September 2012. She also cut Prince William and Prince Harry’s hair since they were kids too. Meanwhile, fans could avail the following hair products to achieve Duchess Kate’s locks: Elnett hairspray, Kiehl’s Creme with Silk Groom, Charles Worthington’s Volume & Bounce Body Booster Mousse, Wella Professionals EIMI Ocean Spritz Spray, Charles Worthington’s Perfect Finish Hairspray, Redken Pillow Proof Blow Dry Extender spray and Mason Pearson hairbrush.